Wind loaded slap avalanches were everywhere. I checked my watch, it was 6:00am, if I wanted to catch sunrise, I needed to start getting ready. I stayed still. Ice covered my sleeping bag, I slowly peaked out of my bag, strings of ice crystals hung down from every point in the tent. Every time I moved, ice would fall all around, into my bag. I couldn’t do it, I was cold inside my bag and it was a lot worse outside. I was a coward, I was a lousy excuse for a professional photographer. When the first rays of sun hit the tent, we all began to stir. It had been a rough night, the wind howled and I had felt it pushing through the tent. We all dragged ourselves out into the sun, it was cold, but there is something about having direct sunshine that negates the cold, or helps you forget about it. It may be sunny, but its still cold! Sy’s icy beard. After breakfast we packed up camp and headed down glacier, following the path Chris and Sy had broken the day before. Even with all the wind , the trail was easy to follow. Wind loaded avalanches were everywhere. The farther down we descended, the deeper the snow got. We switched leads, each taking their turn breaking trail. I got to travel through a nice crevasse section, which I enjoyed. When we moved it was warm, but a stiff breeze from behind prevented us from stopping for any length of time. I shot mostly hand-held, just to spare my companions the extra time of waiting for me to set up my tripod. The scenery was sublime, the north face of Avalanche Spire was a beautiful collection of hanging glaciers. 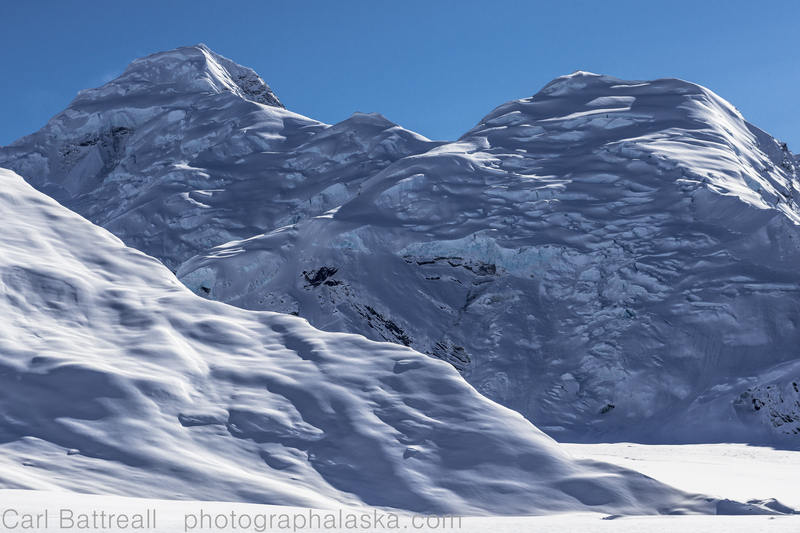 The light was really unique and was perfect for capturing the texture of the glaciers and the character of the mountain. Only the north side of the mountain is glaciated, the rest is steep, fractured rock of low quality. The beautiful north face of Avalanche Spire. 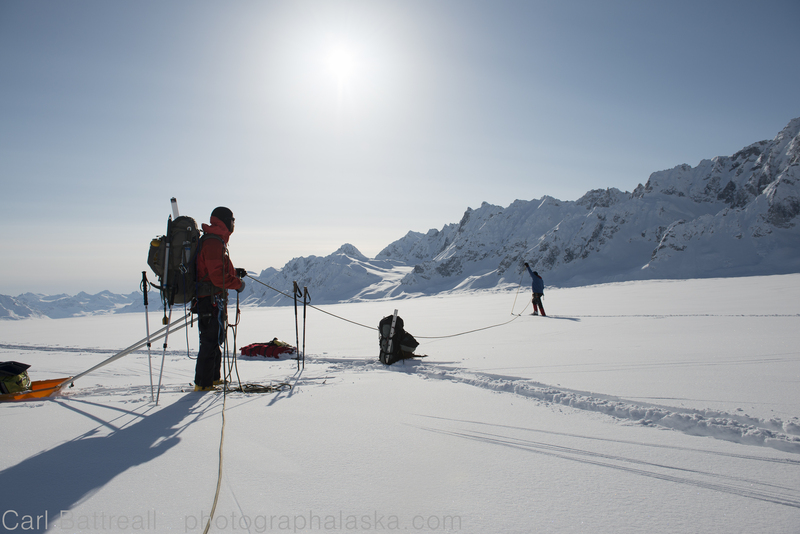 By mid-afternoon we had reached a flat, crevasse free area of the Kahiltna. We could see the entrance to the Pika Glacier, about two miles away. We decided to put up camp. 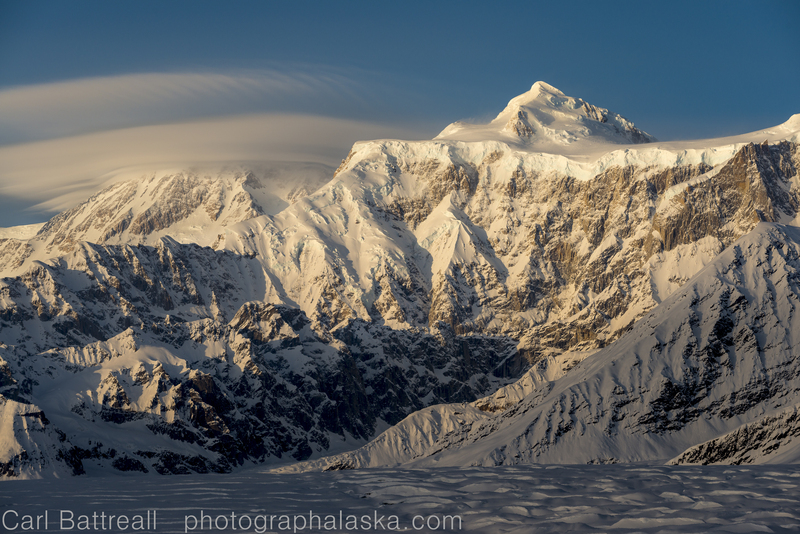 The evening was fantastic, with a great view of Hunter and these huge lenticular clouds over Denali. The temperature was rising. The clouds on Denali and the rising temps were a solid sign of the weather moving in. Last light on Mount Hunter and Denali. Chris Called K2 Aviation and let them know our location. We felt is was wiser to stay where we were, then to push down and then up the Pika. The snow was getting deeper, avalanche danger was a concern and we didn’t think we could get there and pack a runway before the weather went to hell. Chris calling K2 on the SAT phone. We spent the next two days, packing a 1800ft runway, in whiteout conditions. The only good thing was, it had warmed up considerably. We also started to think about our escape. We could either try to ski an extra 40 miles to the road or wait and hope we had enough food to last until a plane came. We each began to think about rationing food, well except Sy, who had enough for at least another week. Sy had forgotten his spoon, and tooth paste, so Chris and I began bargaining with him. “I will let you borrow my spoon for 300 calories of food”. Chris would say. “You could borrow mine for 200!” I would counter offer. On our scheduled pick-up day it was clear and beautiful. 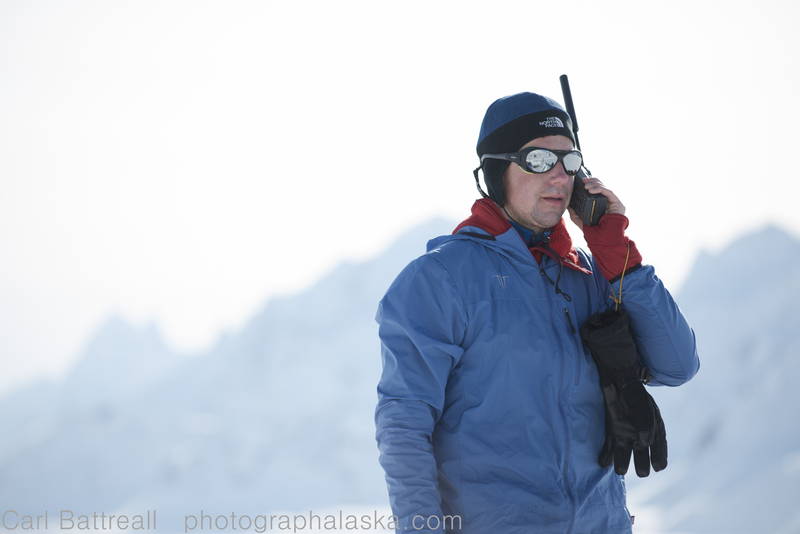 We called K2 and let them know that our weather was great. They however, in Talkeetna, were socked in. 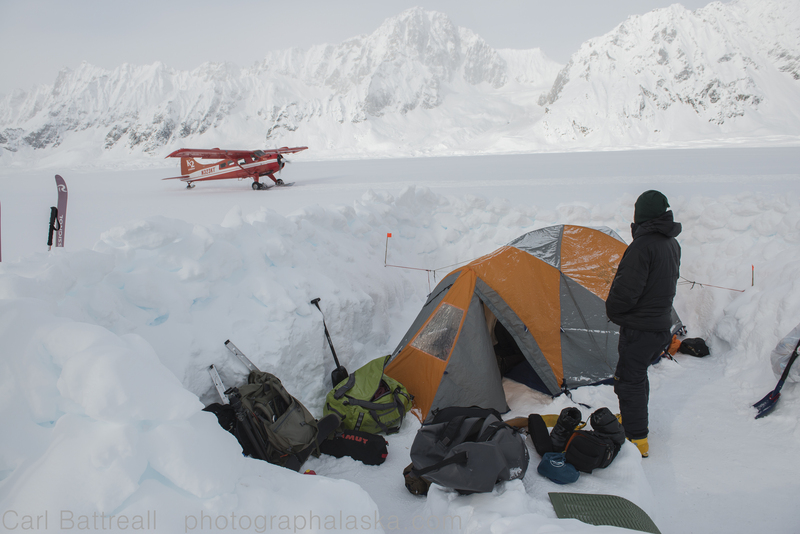 “Make yourself comfortable and don’t pack up camp until you see our plane land!” K2 said, not very inspiring. 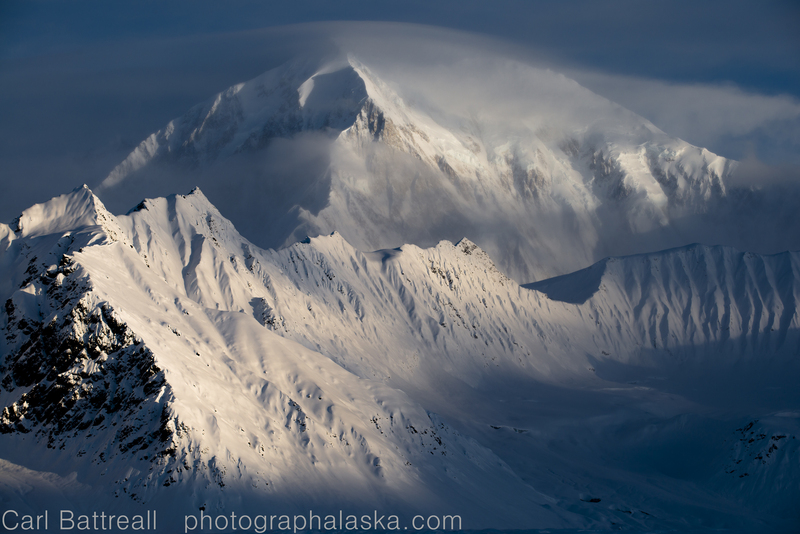 Sy and Chris spent the morning doing laps on the runway while I photographed the changing light on Foraker. “It’s a plane, take off your hood.” he suggested. “How many hoods?” I asked, realizing I had three hoods and a hat on! When I pulled off my layers, I could hear it too. Randy made a few laps before finally settling down. We were proud of our runway but Randy wasn’t impressed. “Too short, not a wide enough turn around, not on a steep enough slope and the wind is the wrong way.” he balked, shattering our egos. The flight down the Kahiltna was great with Randy sharing all his knowledge of the area. In the end the trip was a minor success photographically. I like to get at least five strong images from a trip and I think I accomplished that. The camera issues were a major problem and I am trying to figure out what went wrong. I hope you have enjoyed this journey. The next big trip is in June! 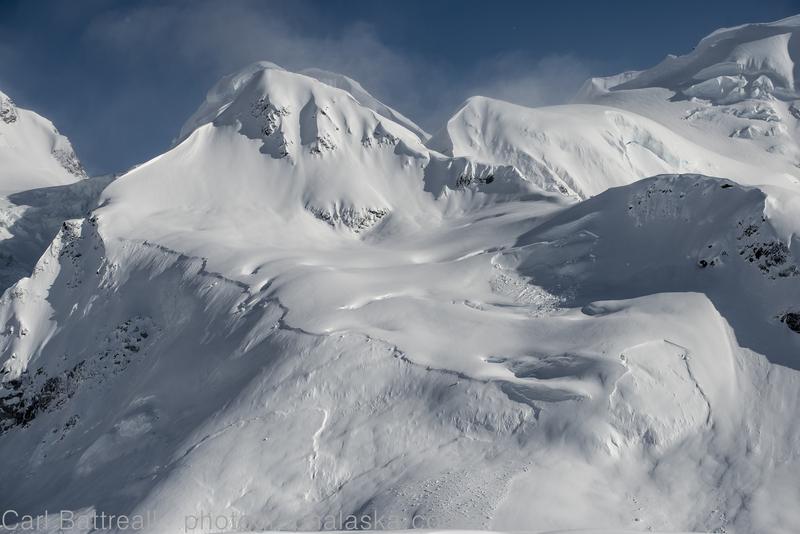 This entry was posted in Expedition Reports, New Photos, Outdoor Skills, Photography Skills, Planning and tagged Alaska, alaska Mountains, alaska photographs, alaska photography, Alaska Range, alaska range project, Avalanche Spire, K2 Aviation, Kahlitna Glacier, Mount Foraker, mountain photography, nikon d800, nikon d800e, Wilderness photography by Carl. Bookmark the permalink. Great photo of Avalanche Spire! As for pilots and runways… They’re never impressed. It could be the worlds best stomped runway with a wide turnaround and the pilot is still going to tell you it’s all wrong. Thanks Billy, I think that is one of my favorite photographs too. Cool Mountain. Amazing pictures and a great trip report up the Kahiltna. I’ve climbed Denali twice but carried an FM2. 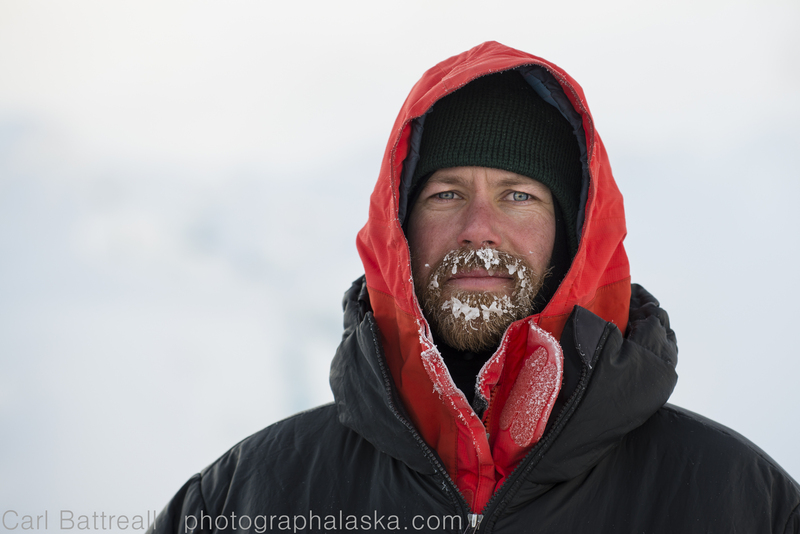 I now shoot with a D800 and was glad to read about your experiences since I am thinking of taking it up into the cold. 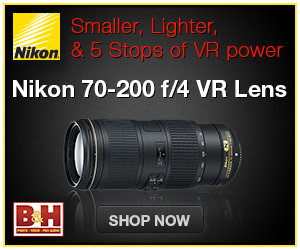 I would be curious to hear if you figured out some of the issues with your gear. By the way, your report reminded me of the “ice ferns” that would grow inside our tent at night. We had a single wall tent the first year to keep things light so we grew a big crop of them. Every time someone would cough those darn things would shear off. I still remember how cold they felt landing on my face. It appears that it wasn’t the cold that was causing the failure, it was the CF card I was using, A Lexar 64GB 600x. The camera did slow down a bit but I think its safe to take it out. The battery life is superb.